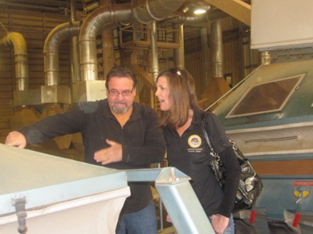 The Western Agricultural Processors Association (WAPA) hosted Assemblywoman Kristin Olsen this past month on a tour of an almond huller, farm and a cotton gin. The Assemblywoman toured the Hulling Company’s almond huller in Chowchilla including visiting the site of their new huller currently under construction. Assemblywoman Olsen is the Vice Chair for the Assembly Ag Committee. The tour was a huge success with the Assemblywoman “tweeting” about her stops along the entire tour! The tour was part of WAPA’s ongoing program to bring legislators and regulators to our operations to educate about them on the critical issues affecting our industry.